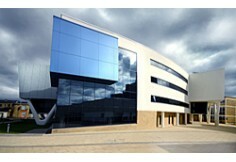 The University of Huddersfield was established in 1825 as the Huddersfield Scientific and Mechanic Institute. A Young Men’s Mental Improvement Society was then established in May 1841 at the encouragement of Frederic Schwann, a German merchant who conducted an export business in the town. 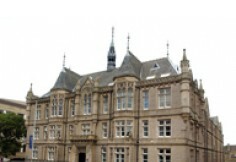 By 1884, after merging with the Female Educational Institute, it had become the Technical School and Mechanics’ Institution and had moved into further new premises, now the Ramsden Building on the Queensgate campus. 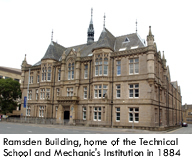 In 1896 it was renamed the Huddersfield Technical College. Over the first fifty years the curriculum changed significantly. Its early success was based on elementary education, but it subsequently provided technical and scientific support for the town’s industries. By the turn of the century both chemistry and textiles were well established, along with the ‘commercial’ subjects needed by many of the manufacturing firms of the day. 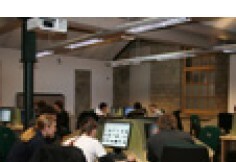 Science, technology and business studies characterised the institution a century ago. By 1914 about 1,800 students were taught at the college, including students for final honours in Arts and Sciences of London University. From 1914 the Technical College continued to evolve in both size and character. Advanced research, especially in chemistry, was an early feature. Student numbers rose steadily, requiring additional premises both on the present campus and elsewhere in the town. 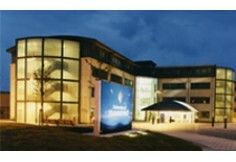 In 1958 there was a further change in name and status to the Huddersfield College of Technology, and the international reputation of the College began to grow. In 1947 a new Huddersfield Technical (Teachers) College had been located within the institution, becoming one of only four in the country. Established in its own premises in 1958, it played a key role in the training of technical teachers not only in the north of England but in many countries overseas. Later, in 1963, the Oastler College of Education was established as a day training college for school teachers. Both merged with the University during the 1970s. In the last fifty years the Queensgate campus has been transformed and expanded to accommodate the rise of student numbers and the creation of new academic departments. By the institution’s 150th anniversary year in 1991 student numbers had topped 10,000. 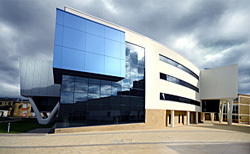 In 1996 the former West Yorkshire College of Health Studies was incorporated into the School of Human and Health Sciences. Today, in 2007, student numbers have reached over 22,000. Students from over 85 countries are represented on campus and the University has a £100 million turnover, contributing £150m to the local economy. University Centres have been established in Barnsley and Oldham to encourage participation in higher education in areas where many people have not traditionally taken up this option. With a strategic plan in place which outlines aims and objectives up to 2013, the University is committed to growth in student numbers, and to achieve a greater range of research excellence.